File image of Union Minister Kiren Rijiju. 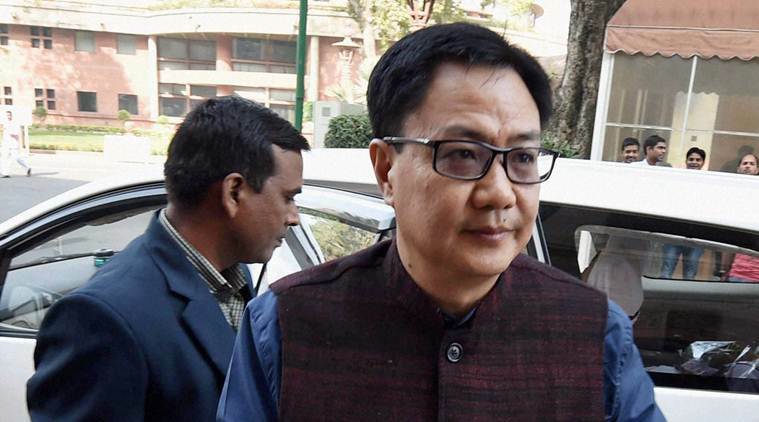 Union Minister of State for Home Kiren Rijiju, who was imphal on Friday, reiterated that no stakeholder states will be harmed because of the Framework Agreement signed by the Centre with NSCN (I-M). Rijiju came to Imphal to attend a security review meeting along with other officials of his ministry. Interacting media immediately on his arrival at the airport, Rijiju while answering queries on Framework Agreement, asserted that no ‘state or community would be harmed’ because of the agreement. He also asked the stakeholder states and communities not to panic unnecessarily. He also asserted that an assurance in this regard had been given by Union Home Minister Rajnath Singh and that the Centre was in touch with all the Chief Ministers and stakeholders on the issue. Rijiju also said his visit was a routine one and part of Prime Minister Narendra Modi’s special focus on development of north-eastern states. During his visit, Rijiju would review various developmental works being implemented in Manipur under his Ministry, besides reviewing the security of the State with Chief Minister N Biren Singh. Rijiju was accompanied by Tripura Chief Minister Biplab Kumar Deb.